Who says you can’t have it all? With the Furhaven Plush Hammock, your cat can play, lay, and scratch the day away! 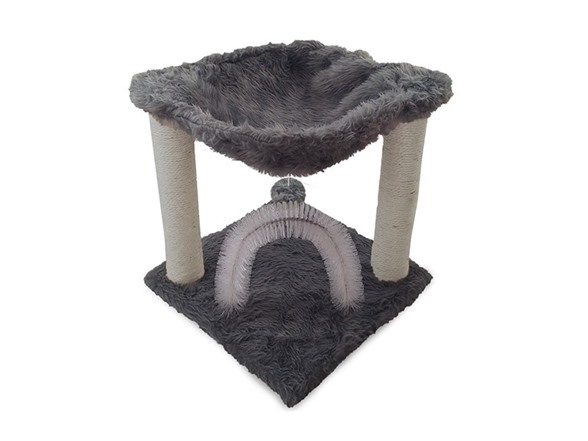 Two sisal scratching posts hold up the luxurious cat hammock which will surely be your cat's new favorite napping spot. The soft plush hammock will mold perfectly to your cats body providing maximum comfort for snoozing. On the sturdy base is a self-petting and grooming brush for your cat to rub against while you’re away. The sturdy bristles are soft enough to massage your cat while still satisfying itches and catching loose fur. Shedding hair will be caught in the bristles resulting in a cleaner house and a quick, easy clean up. Hanging from the hammock is a plush ball that your kitty can bat away at when they’re feeling playful. 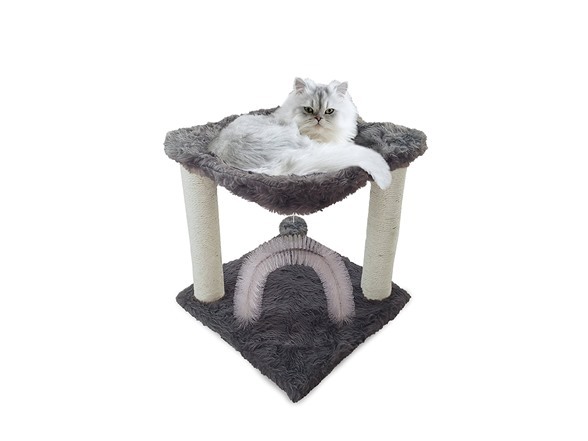 The lush silver cover and small size, this cat hammock will blend perfectly into any home while providing your loved one with maximum comfort and entertainment. Dimensions: 15.75" x 15.75" x 17.3"